Look who showed up in my yard the other day. But is it a preying or praying mantis? Found out that, even though it is a natural predator it is a—praying mantis. Also learned that “mantis” comes from the Greek word for “prophet” or “fortune teller” and that Mantises were considered to have supernatural powers by early civilizations of ancient Greece, Egypt and Assyria. 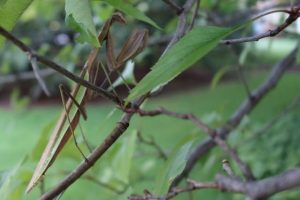 Even though I’ve been a life long bug lover, only recall finding a mantis a handful of times (once on a sidewalk in Malaysia) which may have something to do with its ability to fade into the forms and colors of its surrounding. Once again, had the sense that I was looking at an intelligent, slow moving and awkward alien, as it turned its huge eyes to look at me. 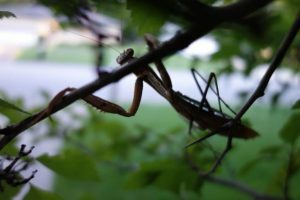 One writer I Googled up spoke of the praying mantis as one of nature’s signature symbols of the connection between creature and Creator. Is that because of its prayerful posturing? Or because it reflects our fallen condition in its reputation for cannibalizing its own especially in its nymph stage, or during mating. Can’t remember what the rest of my day was like. But for a few moments I felt like a child again—caught up in something so natural and yet (like the house fly, ant, or mimicked green leaf or brown twig) a wordless prophet of wonder. It’s amazing to see God’s creativity. He could have made only one kind of animal, tree, plant, or insect. Vaguely I recall something Michael Card had written about creativity. I’ve seen a praying mantis the past three times I’ve mowed the yard. Perhaps this property has a food sources for them. I join with you bubbles in how amazing God’s creativity is. He seems to have given us much to learn about and in that learning we see how totally big our God is, full of wonder and amazement. So much to enjoy when we take the time to really look around. So much to satisfy our curiosity. The praying mantis is a wonder! Always feel privileged to see one. I believe they have only one year to live — about 6 months as an adult. Have come upon them in the fall — out on a walkway or path seeming to be warming themselves in the sun. The ones I have seen are at the end of their lives, am pretty sure. They will raise their amazing front legs in a weak defense, but they do not attack. Usually try to set the amazing bug out of the path of being squashed underfoot. The Lord has given us so many marvels to study! 14C this morning, forecast to reach 22C, no rain but very high humidity. 8 But do not let this one fact escape your notice, beloved, that with the Lord one day is like a thousand years, and a thousand years like one day. 9 The Lord is not slow about His promise, as some count slowness, but is patient toward you, not wishing for any to perish but for all to come to repentance. 10 But the day of the Lord will come like a thief, in which the heavens will pass away with a roar and the elements will be destroyed with intense heat, and the earth and [b]its works will be [c]burned up. thinking about being set free from the slavery of corruption. John 8:36 So if the Son makes you free, you will be free indeed. a wordless prophet of wonder….all creation pours forth speech to declare the Glory of God. The creation of God reminds of of His weightiness. He is an awesome Holy God. Stopping to look up at the night sky for a few minutes makes me feel small and God large. His creation compels me to worship Him. Standing on a cliff and seeing the land fold or standing beneath huge rocks not only reminds of of how big God is, but also makes me think of His holiness. Somehow His holiness and greatness are linked in my thinking. I think we are often preoccupied with who we are and not who HE is. Isaiah said, “Woe is me for I am undone.” I think it is easy for us to forget the mightiness of God and that He is awesome, terrible, and holy. When we stop to see what He has made, it will point us to who and what our Creator is. Even though we can come boldly before the throne, there should also be a healthy fear of God. i think “terrible” comes to mind when we think of our relationship with God comes to mind. in how terrible we have been to Him and the people who bear His image. thinking the terrible goes away in Christ Jesus. yet i know there is a day of great mourning ahead. There is a popular adage that is the subject of songs, poems and philosophies that says to “Stop and Smell the Roses”. Very refreshing, very necessary is the time we spend away from worries, work and life’s pressures. Nothing else is like the joy of experiencing nature in its wonder and beauty. The trap is not to get caught up in letting the joy of nature become work or worse worshiped. As Bubbles has said when we experience observing nature as seen as the wonder of God and see Him in the beauty and wonder of His creation we begin to see our place in it all. Also already said we live in a very noisy and busy world whereas we no longer take the time to sit still watch and listen to the natural things around us. Our ancestors seen constellations in the night sky and so not only named them, but made up stories about them. They watched nature and learned that even the tiny little ant is wise enough to prepare for the dark nights of winter. That there is something eternal in trees and from nature’s bounty what we can eat and what we can’t. Even by observation they learned what plants and growing things have healing properties. I am glad Mart had a day off from his stressful life and was able for a time to watch the wonder of a insect the ancients named “The Praying Mantis”. 64 clear and already beginning to smell the aroma of Fall approaching. I do not care much for insects but I do love polar bears, lions, husky dogs, dolphins to name but a few. I can remember as a child our school used to take us on nature walks but I don’t think I paid much attention as I was too busy giggling with my school pals. These days I can enjoy the countryside and I particularly enjoy being the passenger on a drive through it. I remember two fishermen once telling me they felt nearer to God fishing then they did at church; and I understand where they are coming from, because, there is nothing more peaceful than fishing and I too feel nearer to God in the peace of the countryside than in a bustling city yet I was raised in the town and would not like to live in the countryside. I like people around me even though I may not know them I like to have neighbours. I feel lost in the remote countryside so I believe it is what we are used to that floats our boat. What a wonderful words to that song! I do not know the song. But I love the words! Unlike many here, I am not a bug lover, (except for the pritty ones). I have studied biology, and I remember that I did not like the idea that in the first year I had to study the whole of animal life, the big ones are ok, but all these bugs, and little strange crawling animals, little and weird creatures in the sea! And I felt bad about it, because they are all God’s creatures! Now I think that it is the fallen state of that animal that made him a cannibalist. It is not as God had intended them to be. That we as God’s children will have a part in restoring nature! As Street gave Romans 8:19-23, it actually starts with Romans 8:17-18. “What are little boys made of, made of? There is more to this anonymous poem, but this is enough to set the complexion of my thoughts this afternoon. I have known very few “ladies” who enjoy the company of bugs of any kind, but some who like to see the “Lady Bug” as long as it doesn’t land on them. No small wonder then why the ladies we have here have little else to say about “bugs”. While in nature everything has a purpose, it is hard to find a purpose for gnats or mosquito’s, other than even such “pests” are food for other more “likeable” insects. It is the Dragonfly larva that eats mosquito larva while both in the larva stage in the water. The granddaddy long legs as well as the ordinary house spider that look quite similar eat other smaller “bugs” and so we tend to like them. The house spider I refer to is responsible for those dust bunnies you find under the bed or in hidden corners of the house. Even “little girls” tend to like butter flies, but not moths, yet without either there would be plenty of flowers go without being pollinated. I always wonder what secrets we haven’t learned from the gifts of all of these “bugs” that enable us to live better lives as well as unlock some part of the mysteries of God. But then I am a “little boy”. “Stop and Smell the Roses”. thinking that to believe we have cause and effect over creation is problem-matic. it’s good to sit back wonder about what God has done, continues to, and what He is going to do in the future. thinking about fishing, working, planing, cooking, eating, and just about everything else we do, i ask does it cause us to worship? thinking a lot lately of the phase, “watch with Me,” said Jesus. This is a very beautiful poem by “Helen Steiner Rice”. All who have been here long has seen the pictures of mine Mart was gracious enough to put up for all to see of the many varieties of critters I have fed and still feed in my back yard. I have so many “critter” stories it is hard to just pick a few to talk about. Though most of my stories and all of my pictures involve animals, not insects. With the exception of spider webs that appear late in the summer in the lawn. Noticeable because of the morning dew that illuminates them as being white against the green grass. They only appear for a week or less and always as several in various areas of the yard. They appear almost transparent but all have the telltale signature of being a trap for ground level insects. They all have a conical center that leads to the hole that the spider waits in for its dinner. It reminds me of an almost invisible world that exists around us with the struggles of life and death that go on constantly without our even being aware of. Though I am guilty of on occasion watching as sometimes I do see one insect trying to get its prey. If I ever do interfere it is always to aid in the escape of the prey from the predator. Knowing I really should not interfere, but feeling guilty if I don’t. My most amazing insect story isn’t about anything here in my yard, but rather one I seen on a nature story on video. It is about those termite structures you may have seen in pictures of Africa that stand 8 or 10 feet above the ground. These structures would amount to structures being over a mile high to our construction. They have ground water ventilation systems that give a cool air conditioning airflow throughout the structure and the structure itself inhales carbon dioxide and takes in oxygen. Amazing as these tiny little insects are totally blind as we understand blindness and are after all just a bug. There is a lot to see and learn about ourselves, and our Creator if we just watch and connect the dots. 62 with a little ground fog this morning. Lo and behold… today in the newspsper it says the a duo of american and australian biologists have studies the male praying mantis. Its behavior, so stepping into his final fate, without of fighting it. It turns out that his seed is used for future eggs. His seed, and so not from other males. His self sacrifice is for offspring! That sounds like a type of Christ! Coinkydink, cbrown! :-) We logged in at the same time! *Happy* Saturday to you and all! It is written that no one escapes judgement concerning not knowing that God is because of His creation around them. We, his creation in His image, spend vast amounts of time, money and energy trying to understand God or even prove that there is a God. Yet look around you at the natural world and take a peek into the great abyss of the heavens above us, there found in its unending wonder are glimpses of our creator and of His persona. All throughout the earth we see that everything exists at the sacrifice of something else. The more we learn of the great cosmos, the more we learn of its eternal existence of renewal and rebirth. We are given the senses that are necessary to our being, if we quiet our souls and take the time to stare into the eyes of even the smallest bug, we may yet recognize we are looking into the face of God. A cool 60 degrees this morning in the mountains, an enjoyable relief from this summer’s heat. Walk with me, Lord! Why don’t you walk with me! Be my friend, Lord! Why don’t you be my friend! I know that a Pr.ying Mantis isn’t really praying but it can not help but to be in what looks like a prayer stance. I wonder how different our lives would be to be in a prayer stance always? In constant communication with God. Yes Joyce, God puts people in our pathway and He put Elvis in mine from I was a child. My sister, her friend and I went to every Elvis film that was ever made. We where very young and I would put pictures of Elvis all over my bedroom walls and I was heartbroken when he got married and everyone laughed at what they seen as a school girl crush. I knew everything about his life, he was a Baptist and his gospel music was influenced by his attendance at church from a child. To me he is the rags to riches story who could not cope with his popularity but he loved Jesus and was reading his bible right up till when he died so tragically. Michael Buble said Elvis’s voice had been kissed by God and I think he sings gospel music like a person whose heart has been touched by God. He was influenced greatly by other Southern gospel artists and no one sings gospel quite like they do in my opinion. I have no conscious memory of God standing the sun still for me, but even on the busiest day somehow things get done. It has been a string of busy for me and isn’t letting up. However I wanted to stop in and say a few things. One of my most cherished moments are when I can set on the swing and watch the clouds in the eastern sky wander by. Without exception I always see something in the shapes of the clouds, in fact when Glenna is with me we both can see the same forms that we attach to other things. Interesting that the praying mantis is identified as praying, by every culture and people familiar with seeing it. More interesting is that there is a universal recognition of what praying looks like. I admit there are more times when I don’t fold my hands or kneel or bow my head when I call out to God then when I do. But then when I feel the need to I do. Wondering if seeing prayer in the mantis says more about we who see prayer than any other observation of this “bug”. Do you suppose we find what it is we look for from what it is found deep within our hearts as well as there on the surface? Hi Steve, hard to answer your question, in our language he is also called: praying locust. Even though it is not a locust. We do not have this animal in nothern europe. I was thinking: praying mantis to praying mantis. That is the transformation for every human who turns to God. When a person is touched ay heart, as Street said, the mourning, and turns to God, the praying state. but auto correct changed preying back into praying, sorry for not proofreading..
kinda like being in heaven….the thought of the good ole days will not enter your mind, like the rest of your day. also the idea of sin will be done away with and everything related to the corruption. no emptiness no loneliness vacuum or darkness. everything made new and perfect and will remain that way. why would anyone want less? i am so glad i am not making the calls and that God can make sinners perfect. I can’t sleep as I got a cat who thinks he needs to be outside but I can’t let him out where I live and he is very vocal about what he wants. With a few adjustments to the environment, which I’m working on with zeal and hope, he should come around to my rules. This is day 3 and guess what! He’s asleep in front of me! Yay! Hopefully I’ll fall asleep too so I can get up for Bible Study at 8, the first since July. But what I’ve been thinking about is what God has been teaching me lately, that love is a choice we make based on nothing but how we choose to live out our time in this world in preparation for the next. Powerful stuff, for me anyway. Everyone is moving along at their own pace so I’m sure most here grasp that concept much better already. (Always been a slow learner). It makes so much sense though given its the greatest command Jesus gave us. I’m still shocked at how I can deceive myself into forgetting that and instead focus on my own comforts, or lack thereof. No behavioral conditioning in Gods economy. I sometimes think it would be easier if God just pulled some strings, changed the environment and changed our thought patterns like I’m doing with my cat. But He does use our environment to change us, if we will let Him. Thinking that getting out of my head and practicing loving more is one step closer to being obedient to Christ. Thank you to all my praying friends. I couldn’t live this life without you. I Hope you mean: you couldn’t live without Jesus! Ha ha, but talking things over with each other is encouraging. As long as we point to Jesus. I have been thinking a lot about the greatest command Jesus gave, that loving your neighbor as yourself is the summary of the ten commandments, the second half that is. That is a total new thing, going deeper, and far beyond loving the other as yourself. As I write, again I have to say, this is for those whose identity in Christ is secured, who know that they are loved by God Himself through Jesus. So not for those who are recovering from abuse. They should not read further, but remember that they are loved by Jesus, and that He was with them always, and going with them forever. So now I talk again about the great command of Jesus, He started to say, that everything is coming from love, and going out in love. as John wrote in 1 John 4: It is not us who loved, but it is Him who loved us, that is the starting point of everything in our walk with Him. When we give our lives to Jesus, we say in fact: I do not have to worry about my own life, because You have pledged Yourself in doing that. You take care of me. I do not have to worry about loving myself, as I am focussed on Jesus LOVING me. And the more I focus on how He loved me, as I was unworthy of His love, but He loved me anyway, so I love my neighbor, and even my worst enemies. Not is hating myself, but in seeing that God’s Kingdom will be advanced, by saving my worst enemies through Love, His Love, because He first loved me. As I said before, that is advanced christianity, from being recovered as a lost child, into not minding to be persecuted, as were the apostles, they deemed it an honor to be persecuted, and rejoiced because of it. They knew they were glorifying God. instead of preying on our enemies, we pray for them, and so work in advancing the Kingdom of God. Mart, to have that childlike wonder in our relationship with God. Knowing we can’t but He can we live in a vital connection through prayer which shows our dependence on Him to work in not only our own lives but in the very world around us. It is really a topsy turvy, upside down, inside out thing to understand the more mature one is in their faith they more childlike in dependence they are on and in God. The relationship between the creator and the creation achieved through just talking with Him (prayer). thinking about what poo said…..the more child like, Christ like, the better our prayers. When you are asking God to walk close to you? Do you ever here Him say, ‘I ALREADY AM’. Beautifull song Jeff, thank you very much! May God bless us this day! I most often do not ask God to walk closer to me, I ask Him to help “me” walk closer to Him. By that I mean He can not get any closer than having His Spirit live within me, it is just me who tends not to listen to His guidance or walk in His salvation. thinking about the command to watch with Me. i know i can do nothing apart from Him and that Jesus only does what he sees His Father do. looks like a question of will to me. His will is way better than mine. He came in order that we would have life, abundant life. thank you Jesus. “Not my will but thy will be done” is a good response when faced with ugliness in the heart, mind and spirit; whether mine or others. It’s a prayer I pray often, knowing that ultimately His will is best and good. Even and especially when walking through the valley of the shadow of death. Jesus knew this and finished His walk. I can do no less. thinking of Psalm 95 from a child’s perspective. seems as an adult it impossible to enter His rest. the distance between creature and Creator is great, to say the least. yet is close to the humble and broken. returning home, as great an event as that is, so much greater to abide in His presents. And now abide faith hope and love, and the greatest of these is love. These describe to me the perfect relationship of a child to a parent. A child can live in fleshly confidence if they have these 3 things with parents who like God know how to take care of them. But we are no longer children. I will always be a child of God. Thinking at heart we are always children, this world takes its toil, I am too much of a wanderer so will be much better for me returning home. Thinking what you said about parents Joyce but in this broken world parents do not always do right by their children and I can tell you I am guilty as the next parent. I pass down my insecurities as did my parents to me. It was my mother who often said to me how she had observed that families with alcohol problems had inherited them from either their parents or grandparents. I know people who could fall into a sewer and come out smelling of roses and it is not always because they are righteous people so in this world it does not always seem like justice is served. My mother would always say ‘one person’s meat is another person’s poison’ and history tells us that is correct. It is God’s truth that matters as every nation, culture and religion has their own truths but they are half truths told by one side or another. As my son pointed out to me when I go on vacation I go to the nice places as recommended to the tourist but every country as its ghettoes but they do not advertise the fact. An elderly friend once said to me that in her day and also in mine we where made to believe that life was a fairy tale and she is correct that in our culture it was the done thing for a woman to get married, have children and live happily ever after. As she said no one mentioned ‘living in the real world is not a fairy tale’ and living happily ever after does not apply in this world. I cannot change other people as non believers see me as weak for needing God and I see them as mad for not needing God. There is truths to both, I am weak when I wander from God and also there is madness in not wanting God to control this world when in our humanness we have played a large part in destroying it. I need to forgive others, and to do that I may also need to forgive myself because I am aware that each time I see flaws in others they mirror the flaws that are also in me. The truth hurts deeply because it is God’s truth and not mine or another’s but the source of the God who dwells in me and you. I thank God for it because it transforms me from the inside where the depravity in me lies. wonder what abraham was thinking when the angels showed up on there way to sodomn. angels, prophet, a Word of encouragement showing up unexpected. thinking there are two kinds of people in the world preying and praying. yes we were all born carnivores, but some pray. praying implies relationship. to One or one of supernatural powers. a power the enslaves us or frees us. paul wrote about being a slave to One Who Loves him much and He proved it. praying is change, hit or miss from the inside out. super natural power or the Holy Spirit from God. intelligent, slow, and awkward would describe many brothers and sisters. sometimes one comes into view and it is a great time of kindred spirit. especially when going through a storm or to strengthening prior to. the times of trials and testing are to be expected just as much as His return. a time for watching and praying. thinking if the heaven pour forth speech daily so does the earth. like job, praying to speak and think correctly to meet God. thinking of enoch and elisha, they knew Him very well. envy and pride go before a fall. and we have tasted a bit of the granular dark. Is that I have loved you at your darkest. I watched a true American movie the other night and in it a son said to his mother that he always knew she loved his brother more than him and he also knew why because his brother was everything he was not, successful at everything he did. The mother replied to her son ‘Any mother will tell you she loves her children the same, but differently’. Your brother was more needy than you for my advice, you where my strong son, the one on whom I could depend on, but I need you to know that I never loved you any less, you are loved every much as your brother was. (the brother had been killed). I understand this very well having two sons one whom I see stronger than the other. God can teach us so much from our own earthly experiences when we allow Him to. It is God who knows His children, their good points and their bad, yet He loves us the same. other brother wondering if his mother loved him less I wonder if God favours some. The answer is in the mother’s response to her son! Viv if you liked the story of the movie you mentioned I would recommend to you a book by John Steinbeck or the movie adaption staring James Dean called “East of Eden”. Real life always has more drama and substance than fiction. Fiction just gives us a way of presenting it. Praying your day has been blessed already. Viv your story reminds me of the prodigal son. Yes Jesus loves us all! Winners and losers! I think that getting past caring how successful, how talented, how accepted we are even we begin to get a real glimpse into who Jesus really is. And we can focus on Him and less on ourselves. Oh the joy of not caring how we look when we compare ourselves to others, whether in the church or outside. In spite of all my issues and problems the Lord has given me the ministry to help those around the fringes of the church. To remind them they are loved just as much and that God is with them in all their discomforts and pain. I sometimes wonder if we will ever see the ideal as set forth by Paul. It’s certainly a daily struggle, yet God will raise up His church in the midst of the chaos. Blind faith and trust in Him is all that’s needed. Now someone may come back with “we should not compare ourselves with others”, and I agree, yet we still do it anyway, it’s part of our fallen nature. Our common struggle to let go of what we want and embrace only what Jesus wants. Loving others as we love ourselves. Thank you Steve for recommending the book, I do remember the film but have forgotten the story. I agree with you I love watching fact based movies. There is a fact based series started on television here called Victoria based on the life of ‘Queen Victoria’ and it makes marvellous viewing and brings to life how life was at that time. I have heard of the term hanged, drawn and quartered but did not know how barbaric it was. It was the penalty for treason in England since 1351 and I learned from this programme that ‘Queen Victoria’s had a member of staff, whose relative was to meet this fate. The Queen mentioned to the then Prime Minister that she wanted it known that she was against this penalty and he told her it was his duty to inform her that she had the authority to change this penalty and so she revoked the punishment. Thinking of how civilised we have become from those days makes me realize that the modern world has many benefits that the Victorian age did not know. Each generation sees the world from their perspective while God sees it from the whole perspective. I believe I have glimpses of God raising up the church but nothing more than glimpses but it is in those glimpses that hope and encouragement come. It is in those moments that I can forget all the discomforts and pain (I do not talk of physical but mental) and realize that my faith is more blurred than blind and that God is not a figment of my imagination but a very real force of justice who will make all things right. It is in those moments that my faith becomes fact and the doubts that arise from this world have faded into the abyss and I am alone with God; until a voice from this world distracts me and I am back to the reality of the chaos of this world. I see in part but it is often like I dreamt it and as you say Joyce it is a daily struggle. Viv once again I will say that I think you have a very good and healthy outlook on life as a Christian. Stay grounded and stay the course. I will add to you and all the others who read along that we so enjoy the BBC shows that our Public TV airs as both the actors and story lines are very basic and down to earth. Most of the TV offering today here in the USA are not worth the trouble of turning on the TV. There are more modern movies that I enjoy, but one of my old favorites is “How Green Was My Valley” a story of a coal mining community in Wales and of the people who lived there. It always reminded me of right here where I live and of the people who helped make me who I am. I don’t know how much more we can get out of Mart’s bug story, but I do know he likes it when we just are cordial and talk to each other politely and with as much encouragement as possible. When I think of the Bible stories and the people showcased there I am reminded that only a small amount of their lives are shared with us. There were a lot less eventful days that they lived, but none the less human just like all of us do. Stand fast, enjoy what you can of life, and be patient with God as He certainly has been patient with us. Thank you Steve, for your encouragement! It is not a bad idea to have this topic on for a longer time. Like: all humans are like preying mantis’, and according to the hope of God, who wants all man to be saved, they all will turn into praying mantis’. The other thing that I was thinking, many of us look like a praying mantis, but inside we are like a preying mantis. We have a religious look but inside is a different thing. But that is a very negative thought, all though the bible says, that the heart is deceitful, of all things on earth most deceitful. We hardly know how lost we were. Hopefully most of our bad traits have been exposed during the years and we are being cleaned by the Holy Spirit bit by bit. We should rely on the Holy Spirit, and give ourselves totally to God- God the Father, God the Son, God the Holy Spirit. the Holy Spirit who is well capable of training and disciplining us. Like God trained Jacob for a long time, in sending him to Laban, and finally his name was changed frin Jacob to Israel. This week Psalm 138 is on the program of the dutch protestant churches. This is such good advice, instead of getting irritated about what others say, just do the more what you already did: Worshipping God! dear forerever, after reading what you wrote i was reminded in Romans how equally condemned the pagan and the jew are. there is no room for bragging or boast in knowledge. paul leads the reader through a mind field of one difficulty after another to be wrestled with. thank God for chapter 8!!! i think this is mentioned in chapter 2 and there are 5 more hurdles to go. if some ones jumps all over you for the truth, why would you be surprised? yes it is a difficult place to be, but not impossible. praying my way through another day. “The scepter shall not depart from Judah, Nor the ruler’s staff from between his feet, Until Shiloh comes, And to him shall be the obedience of the peoples. On facebook this morning there was a thing showing what comes out of a pr..ying Mantis when submerged under water. Living within it is a parasitical worm that needs water and it comes out when the Mantis is submerged. It is about a meter long and black. Talk about gross. Once again, can’t tell you how much I appreciate the spirit and thoughtfulness of what all of you are adding to one another. In addition to the many perspectives shared, Steve expressed so well my desire for the free-flowing conversations of BTA when I’m not making frequent contributions. And for my part I’ll try to keep offering something to consider together from the Story of life, Scripture, nature etc. Steve, you said I have a good and healthy outlook on being a Christian and I thank you for your comments for they are what I need to hear, that I am on course, as I spent so much time wandering. God as good reasons for how he works in us and myself I believe I spend too much time worrying about whether I am right with God rather than as you say ‘staying grounded’ in Him and staying the course. I wish I were more like my earthly dad who walked with God so easily, or maybe it was that he made it look so easy, but either way righteousness was natural to him while I am apt to wander and struggle. From what I know of you Steve, you are much like my dad and by that I mean you know what is righteous without having to be told what is righteous. I, on the other hand, need guidance or I wander and become confused, and Christ is my refuge when I am off balance. Understanding God’s will in my life does not come easy for me and so I spend more time taking refuge in Christ and it is where my confusion fades and I gain strength to go on without worrying whether I am doing God’s will but doing my best knowing that God will do the rest. I find that if I do not focus on Christ then I let others (mainly unbelievers) distract me and that is my weakness, because, it was not my earthly dad’s, my father was confident in that his righteousness was from God and that he was doing God’s will because he did not align himself with race, religion or culture but with Godly values as he believed that should be reflected in the life he lead. He was critical of those who talked the talk but did not walk the walk because his life reflected action more than it did words and he was right as it is proven in my own Country that words can be more deadly than weapons. My father would have kept silent rather than fuelled an argument and to think I often seen that as weakness. God is always teaching us and I believe I am finally listening. Let the words of my mouth, and the meditation of my heart, be acceptable in your sight, O Lord, my strength, and my redeemer. This is day 14 of the Pr_ying Mantis conversation. Thanks for checking in, Mart. Hope you are well and filled with the joy of the Lord. 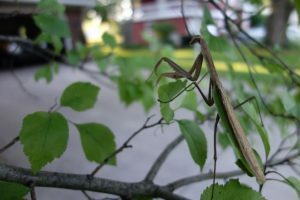 What caught my imagination this morning was the statement that the mantis is the “wordless prophet of wonder.” So it is. The praying mantis is an intelligent creature, it seems to me. Somehow, I think of God’s wisdom when I see a mantis — which is not often, but always most impressive! 8C and clear in the valley. Good afternoon, I have had a couple days of minor computer problems that has had me silent. For that reason I apologies to Foreverblessed and Viv for not being able to respond. Maru I always guessed they recognized Moses and Elijah by hearing the conversation going on between Jesus, Moses and Elijah. I have read and heard many discussions concerning the matter of the vision on the Mount of Transfiguration. Which most often lead to very deep Bible Study with no real concrete explanations, both figuratively and literally. I still believe that the two prophets mentioned in Revelation at the Tribulation period to be Elijah and Enoch, not Moses, but it is just my belief because neither of these men ever died. Viv it is a very humbling honor for me to be compared in any way to your dad, thank you for that. Foreverblessed I agree we, especially me, could talk on and on about nature without ever getting tired of it. In fact Joyce sent my wife a very interesting picture of an orchid whose buds look like people knelt in prayer and whose blooms look like a white dove, it is a very interesting flower and like our Praying Mantis is viewed by us as a prayer posture and the Holy Spirit in the form of a dove because of our nature and educations in the matter of our faith. Thank you Mart as well for the encouragement and for all you do on our behalf. It was 46 this morning and rose to 44 this afternoon. Fall is here. i was thinking worship is the farthest thing from work. Steve, Wow! It was chilly where you are. only 44 this afternoon? It was 82 where I work today. shoo. Cooler temps would be nice. . . before they turn on the heat. It’s been chilly here in the mornings and I closed the window last night. My apologies to all, Bubbles, it was a typo, the high yesterday was 74 not 44. I guess I need to do a better job editing. Mart appreciates it when we keep the discussion going, without him changing the subject that often. Or that we talk with each other in an uplifting and encouraging manner! To Maru, I was thinking, when the Spirit reveals something, you just know. Without words you know. So I personally believe that they “knew” that the people there with Jesus was Moses and Elijah. I could compare it to dreaming, when I dream, I “know” that some or other person is there, but without actually “seeing” them. They are in my dream, and I just know who they are. Just by there being there, not because I see them. We have had a very cool spring, and summer too, that is during the day, but because the nights were warm, this summer will be one of the warmer ones. I was thinking about the wonder of nature! Just looking at the beautiful flowers, putting a seed in the ground, and then, lo and behold, something grows out of it! Or a sunset, or sunrise! But I believe that the greatest wonder, or miracle is, when a soul repents and turns to God! I also believe that that is how God looks at the earth, He is not that impressed about nature, that is just following the rules of nature, but that He is so pleased about a soul opening his heart for Him! That is the greatest miracle. And we as His Body of believers have a part in that. Showing in our lives what Jesus is like. Just BE like Him, not always talking about Jesus. I live in an environment where most people are hostile to the Word: Jesus. I cannot use it, as soon as I use it, doors shut. So I am learning to hear what the Spirit is telling me. If I do not hear a word clearly, I will not open my mouth about the Gospel. But in my being I believe I am showing what the Gospel is: How turning to Jesus can change a person to a beautiful and lovely person, all because of Jesus, changing our hearts cleaning it from the inside out, by us looking to the Cross in faith! How that works,being a witness to Jesus, without talking. I was playing tennis here in the town, with a mate. And we were having opponents who were not very nice, even almost nasty. But I remained calm, and polite to them. Telling my mate to be patient. I am surrounded by people who tell me to keep my beliefs to myself because they do not share them, family and friends, but likewise I surround myself with people who do share my beliefs and it is there I find encouragement and hope. I am not always disciplined enough to keep my mouth shut when I should but I can tell you that words are like weapons and spoken in haste does more damage than good. My father was very disciplined at being a silent witness because where there were arguments and division he knew when to speak and when not to and what to say to diffuse a situation rather than add fuel to the fire. Yes, forever, I am learning to keep my mouth shut when I realize that the least said soonest mended. I am the one who professes to be a Christian so I must be the one to behave like one regardless of what others do. It makes sense if you think about it, a non believer does not believe so he does as he pleases but I am to reflect Godly behaviour which means behaving likewise. Sadly I fall into the trap of allowing others behaviour to rub off on me and that is why I am reluctant to call myself a Christian because I know in my heart that I may let God down when faced with nasty people. If I have learned anything in life it is that calling myself a Christian in no way reflects that I am one. My father knew that walking the walk was much more important than talking the talk but he never told me just how difficult that would be when living in a world that as you say Forever, is alien to Jesus. In the secular world men have turned to science and not God but if they had have listened to God in the first place they would not need science. God will use science to free man from his own ignorance because He is a God of love and mercy and His ways are not man’s way. Blessing all mine with ten thousand beside!